This article refers to Medicare, a United States health insurance program. For similarly named programs in other countries, see Medicare. Medicare is a federally funded health insurance program in the United States, designed to cover older individuals and those who meet other special criteria. In general, Medicare is available to U.S. citizens, or permanent legal residents having at least five consecutive years of residence in the United States, who are 65 years or older. Individuals who are under 65 and meet the citizenship or residency requirements may be eligible for Medicare if they are disabled and have received other forms of assistance such as Social Security or Social Security Disability Insurance for a minimum of 24 months. Medicare is an entitlement program and not based on financial need. American citizens are automatically eligible for Medicare upon reaching the age of 65 because they, or their spouses, paid Social Security taxes during their working years. Medicare is very different from Medicaid, a government assistance program that provides health care benefits to certain categories of low-income individuals, although they are often associated. Unlike Medicaid, which is jointly funded by federal and state governments and has eligibility criteria which vary from state to state, Medicare is fully funded by the federal government and its criteria are consistent nationwide. Medicare provides insurance benefits in several different areas including hospital stays, post-hospital skilled nursing care, and prescription drug coverage. There are gaps in its coverage, however, which individuals may elect to cover through private "Medigap" insurance plans, or, if they are eligible, Medicaid. Throughout its history, Medicare has experienced and continues to experience steady increases in spending due to challenges such as a growing aged population, concerns about waste and fraud, and increases in health care costs, which have led to projections of financial insolvency. For a society that values the contributions made by its population during their working life, Medicare is a significant social welfare program and efforts continue to be made to improve the program and solve its problems. Medicare is a social insurance program administered by the United States government providing health insurance coverage to people who are aged 65 and over, or who meet other special criteria. 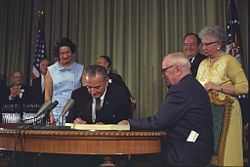 It was originally signed into law on July 30, 1965, by President Lyndon B. Johnson as amendments to Social Security legislation. At the bill-signing ceremony President Johnson enrolled former President Harry S. Truman as the first Medicare beneficiary and presented him with the first Medicare card. In 1973, Medicare was expanded to cover people under the age of 65 who needed dialysis or transplants due to kidney failure, as well as those with specific disabilities. Initially, Medicare was administered by the Social Security Administration. In 1977, it was transferred to the Department of Health and Human Services (DHHS). The Centers for Medicare and Medicaid Services (CMS), a department of DHHS, administers Medicare, Medicaid, the State Children's Health Insurance Program (SCHIP), and the Clinical Laboratory Improvement Amendments (CLIA). The Social Security Administration continues to be responsible for determining Medicare eligibility and processing premium payments for the Medicare program. Since Medicare is a federal program, the rules for eligibility, coverage, and costs are constant throughout the nation. Medicare is partially financed by payroll taxes imposed by the Federal Insurance Contributions Act (FICA) and the Self-Employment Contributions Act of 1954. In the case of employees, the tax is equal to 2.9 percent (1.45 percent withheld from the worker and a matching 1.45 percent paid by the employer) of the wages, salaries, and other compensation in connection with employment. Until December 31, 1993, the law provided a maximum amount on which the Medicare tax could be imposed each year. Beginning January 1, 1994, the compensation limit was removed. In the case of self-employed individuals, the entire 2.9 percent tax of self employed net earnings must be paid by the self-employed individual, however half of the tax can be deducted from the income calculated for income tax purposes. In general, individuals are eligible for Medicare if they are a U.S. citizen or have been a permanent legal resident for five continuous years, and they are 65 years or older, or they are under 65, disabled and have been receiving either Social Security or the Railroad Retirement Board disability benefits for at least 24 months, or they get continuing dialysis for permanent kidney failure or need a kidney transplant, or they are eligible for Social Security Disability Insurance and have amyotrophic lateral sclerosis (ALS-Lou Gehrig's disease). Many beneficiaries are dual-eligible. This means they qualify for both Medicare and Medicaid. In some states for those making below a certain income, Medicaid will pay the beneficiaries' Part B premium for them (most beneficiaries have worked long enough and have no Part A premium), and also pay any drugs that are not covered by Part D.
In 2007, Medicare provided health care coverage for 43 million Americans. Enrollment is expected to reach 77 million by 2031, when the baby boom generation is fully enrolled. A Medicare card, with several areas of the card obscured to protect privacy. There are separate lines for Parts A and B, each with its own date. There are no lines for Parts C or D, as a separate card is issued for those benefits by the private insurance company. The original Medicare program has two parts: Part A (Hospital Insurance), and Part B (Medical Insurance). Only a few special cases exist where prescription drugs are covered by original Medicare, but as of January 2006, Medicare Part D provides more comprehensive drug coverage. Part C or Medicare Advantage plans are another way for beneficiaries to receive their Part A, B, and D benefits. Most individuals automatically enroll in Medicare Part A without having to pay a premium because they, or their spouse, paid sufficient taxes while working. Medicare Part A covers hospital stays and certain services following a hospital stay. These include stays in a skilled nursing facility, such as a nursing home or hospice care for terminally ill patients, and treatment received there, such as physical therapy. Medicare Part B medical insurance helps pay for some services and products not covered by Part A, generally on an outpatient basis. Part B is optional and may be deferred if the beneficiary or their spouse is still actively working. There is a lifetime penalty (10 percent per year) imposed for not enrolling in Part B unless actively working. There is a monthly premium charged for Part B insurance. Part B coverage includes physician and nursing services, x-rays, laboratory and diagnostic tests, influenza and pneumonia vaccinations, blood transfusions, renal dialysis, outpatient hospital procedures, limited ambulance transportation, immunosuppressive drugs for organ transplant recipients, chemotherapy, hormonal treatments such as lupron, and other outpatient medical treatments administered in a doctor's office. Medication administration is covered under Part B only if it is administered by the physician during an office visit. With the passage of the Balanced Budget Act of 1997, Medicare beneficiaries were given the option to receive their Medicare benefits through private health insurance plans, instead of through the original Medicare plan (Parts A and B). These programs were known as "Medicare+Choice" or "Part C" plans. In 2000, almost 16 percent of all Medicare beneficiaries participated in "Medicare+Choice" plans. This use of such plans has moved Medicare away from its original role as the insurer to a role as purchaser of health insurance. Pursuant to the Medicare Prescription Drug, Improvement, and Modernization Act of 2003, the compensation and business practices changed for insurers that offer these plans, and "Medicare+Choice" plans became known as "Medicare Advantage" (MA) plans. Medicare Advantage Plans that also include Part D prescription drug benefits are known as a Medicare Advantage Prescription Drug plan or a MAPD. Medicare Part D went into effect on January 1, 2006, by the passage of the Medicare Prescription Drug, Improvement, and Modernization Act. Anyone with Part A or B is eligible for Part D. In order to receive this benefit, a person with Medicare must enroll in a stand-alone Prescription Drug Plan (PDP) or Medicare Advantage plan with prescription drug coverage (MA-PD). These plans are approved and regulated by the Medicare program, but are actually designed and administered by private health insurance companies. Unlike Original Medicare (Part A and B), Part D coverage is not standardized. Plans choose which drugs (or even classes of drugs) they wish to cover, at what level (or tier) they wish to cover them, and are free to choose not to cover some drugs at all. The exception to this is drugs that Medicare specifically excludes from coverage, including but not limited to benzodiazepines, cough suppressants, and barbiturates. Medicare Part A and Part B together do not cover all the medical services that individuals require. Also, there are many health insurance plans offering greater coverage that are available to younger individuals. This gap in coverage led to options for additional insurance for Medicare enrollees. Some individuals with limited financial resources qualify for Medicaid, which covers many of the services not covered by Medicare. Others, who do not qualify for Medicaid, may elect to purchase a type of supplemental coverage, called a Medigap plan, to help fill the gap in their needs for medical coverage. These Medigap insurance policies are standardized by CMS, but are sold and administered by private companies. Some Medigap policies sold before 2006 may include coverage for prescription drugs. Medigap policies sold after the introduction of Medicare Part D on January 1, 2006, are prohibited from covering drugs. Neither Medicare Part A nor Part B pays for all of a covered person's medical costs. The program contains premiums, deductibles, and coinsurance, which the covered individual must pay out-of-pocket. Some people may qualify to have other governmental programs (such as Medicaid) pay premiums and some or all of the costs associated with Medicare. Most Medicare enrollees do not pay a monthly Part A premium, because they (or their spouse) have had 40 or more quarters in which they paid Federal Insurance Contributions Act taxes. Only those eligible for Medicare but who do not have 40 or more quarters of Medicare-covered employment are required to pay a monthly premium. All Medicare Part B enrollees pay an insurance premium for this coverage. Medicare Part B premiums are commonly deducted automatically from beneficiaries' monthly Social Security checks. Part C and D plans may or may not charge premiums, at the programs' discretion. Part C plans may also choose to rebate a portion of the Part B premium to the member. Both Medicare Parts A and B have annual or benefit period (episode of illness) deductibles and coinsurance charges that must be paid for covered services. These are standard amounts for all individuals, although they may change from year to year. The deductibles and coinsurance charges for Part C and D plans vary from plan to plan. Medicare and Medicaid Spending as percentage of GDP. As an expansive social insurance program, Medicare often faces funding challenges such as long-term financial viability, the aging population at large, as well as waste and fraud. According to the 2004 "Green Book" of the House Ways and Means Committee, Medicare expenditures from the American government were $256.8 billion in fiscal year 2002. Beneficiary premiums are highly subsidized, and net outlays for the program, accounting for the premiums paid by subscribers, were $230.9 billion. These expenditures are increasing, both in absolute terms and as a percentage of the federal budget. Total Medicare spending reached $440 billion for fiscal year 2007, or 16 percent of all federal spending. The only larger categories of federal spending were Social Security and defense. Spending on Medicare and Medicaid is projected to continue to grow with the result that the Medicare hospital insurance trust fund has been projected to become insolvent, possibly before 2020. Future growth in spending per beneficiary for Medicare and Medicaid—the federal government’s major health care programs—will be the most important determinant of long-term trends in federal spending. Changing those programs in ways that reduce the growth of costs—which will be difficult, in part because of the complexity of health policy choices—is ultimately the nation’s central long-term challenge in setting federal fiscal policy. …total federal Medicare and Medicaid outlays will rise from 4 percent of GDP in 2007 to 12 percent in 2050 and 19 percent in 2082—which, as a share of the economy, is roughly equivalent to the total amount that the federal government spends today. The bulk of that projected increase in health care spending reflects higher costs per beneficiary rather than an increase in the number of beneficiaries associated with an aging population. Another segment of the cost of Medicare is attributable to fraud, which government auditors estimate costs Medicare billions of dollars a year. The Government Accountability Office lists Medicare as a "high-risk" government program in need of reform, in part because of its vulnerability to fraud and partly because of its long-term financial problems. Medicare is the largest publicly funded health insurance program in the United States and plays an essential role in caring for the needs of the elderly and disabled. For some, it represents what national health insurance could be in the United States. When it began in the 1960s, Medicare covered approximately 19 million individuals aged over 65. By the beginning of the 21st century it had expanded to over 39 million, with the number projected to increase to 78 million by 2030. As a result of the large numbers of individuals involved, its large share of the federal budget, and the rapid rate of its expansion, Medicare has been subjected to much scrutiny and changes and improvements have continually been under discussion. Competing approaches to reform include reducing per capita spending through incremental changes or major structural reforms, such as shifting Medicare to the control of private plans. Incremental approaches generally involve changing payment policies, and have been criticized as focusing on prices charged rather than the amount of use of services. As the population ages, the needs for healthcare for the elderly increase. There are many concerns about financing good quality health care that is appropriate for this segment of the population. One concern is that health insurance through Medicare will not continue, or not at an affordable price, due to federal budget cuts. Related to this is the concern that funding for Medicare provided by the Social Security Administration will be exhausted and the program become insolvent before the aging population, particularly Baby Boomers, are old enough to benefit from the taxes they pay. Medicare faces continuing challenges dealing with the financial viability, availability, and quality control of services that cause widespread social concerns. In its 2006 annual report to Congress, the Medicare Board of Trustees reported that the program's hospital insurance trust fund could run out of money by 2018. The fundamental problem is that the ratio of workers paying Medicare taxes to retirees drawing benefits is shrinking at the same time that the price of health care services per person is increasing. From 3.9 workers paying taxes into Medicare for every older American receiving services as the baby boom generation retires, this figure is projected to drop to 2.4 workers for each beneficiary by 2030. 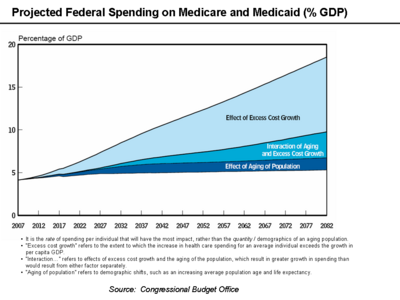 However, Medicare spending is expected to grow by about 7 percent per year during that time period. As a result, the financing of the program is out of actuarial balance, presenting serious challenges in both the short-term and long-term. The debate over how to improve Medicare and resolve this problem has lasted many years without resolution. Despite, and perhaps as a result of, the Medicare Prescription Drug, Improvement, and Modernization Act enacted in 2003 and which produced the largest overhaul of Medicare in its history, Medicare continues to face serious financial problems. Because Medicare's unique role in serving the elderly population, solutions to its challenges are of vital importance to American society. ↑ Social Security Online, Medicare Is Signed Into Law, Social Security History, Social Security Online. Retrieved November 29, 2008. ↑ Trustees Report & Trust Funds, Overview, Trustees Report & Trust Funds Overview, Centers for Medicare and Medicaid Services, 2008. Retrieved November 29, 2008. ↑ University of Iowa Health Care, Medicare: Part A & B, University of Iowa Hospitals and Clinics, 2005. Retrieved November 29, 2008. ↑ 4.0 4.1 4.2 Marilyn Moon, Medicare, Encyclopedia of Public Health (The Gale Group Inc., 2002). Retrieved December 5, 2008. ↑ Product/Drug/Drug Category, Part D Drugs/Part D Excluded Drugs, Centers for Medicare and Medicaid Services, 2006. Retrieved November 29, 2008. ↑ California Healthline, Annual Federal Report Forecasts Medicare Funding Gap by 2019, California Healthcare Foundation, 2008. Retrieved November 30, 2008. ↑ The Boards of Trustees, Federal Hospital Insurance and Federal Supplementary Medical Insurance Trust Funds, 2008 Annual Report of the Boards of Trustees of the Federal Hospital and Federal Supplementary Medical Insurance Trust Funds, Centers for Medicare and Medicaid Services, March 25, 2008. Retrieved December 4, 2008. ↑ 8.0 8.1 American Academy of Actuaries, "Medicare’s Financial Condition: Beyond Actuarial Balance," American Academy of Actuaries, March 2008. Retrieved December 4, 2008. ↑ 9.0 9.1 Lisa Potetz, "Financing Medicare: An Issue Brief," Kaiser Family Foundation, January 2008. Retrieved November 29, 2008. ↑ Peter R. Orszag, The Long-Term Budget Outlook and Options for Slowing the Growth of Health Care CostsCongressional Budget Office Statement before the Committee on Finance United States Senate, June 17, 2008. Retrieved December 4, 2008. ↑ U.S. Government Accountability Office, Medicare: More Effective Screening and Stronger Enrollment Standards Needed for Medical Equipment Suppliers, GAO, September 22, 2005. Retrieved December 4, 2008. ↑ United States General Accounting Office Medicare Fraud and Abuse: DOJ Continues to Promote Compliance with False Claims Act Guidance, GAO Report to Congressional Committees, April 2002. Retrieved December 4, 2008. ↑ 13.0 13.1 The Boards of Trustees, Federal Hospital Insurance and Federal Supplementary Medical Insurance Trust Funds, 2006 Annual Report of the Boards of Trustees of the Federal Hospital Insurance and Federal Supplementary Medical Insurance Trust Funds, Centers for Medicare and Medicaid Services, May 1, 2006. Retrieved December 5, 2008. ↑ CMS Office of Public Affairs, 2006 Medicare Trustees Report, Centers for Medicare and Medicaid Services, May 01, 2006. Retrieved December 5, 2008. ↑ Public Agenda, Fewer Workers Projected Per HI Beneficiary, Public Agenda, December 4, 2008. Retrieved December 5, 2008. ↑ Public Agenda, Medicare Costs Per Person, December 4, 2008. Retrieved December 5, 2008. Clark, Robert L., Richard V. Burkhauser, Marilyn Moon, Joseph F. Quinn, and Timothy M. Smeeding. The Economics of an Aging Society. Wiley-Blackwell, 2004. ISBN 978-0631226161. Fried, Joseph. Democrats and Republicans—Rhetoric and Reality: Comparing the Voters in Statistics and Anecdotes. New York, NY: Algora Publishing, 2008. ISBN 978-0875866048. Johnson, Carrie. "Medical Fraud a Growing Problem: Medicare Pays Most Claims Without Review." The Washington Post June 13, 2008. Retrieved November 25, 2008. Lemieux, Jeff, Teresa Chovan, and Karen Heath. "Medigap Coverage And Medicare Spending: A Second Look." March/April 2008. Retrieved November 25, 2008. Marcus, Aliza. "Senate Vote on Doctor Fees Carries Risks for McCain." Bloomberg News July 9, 2008. Retrieved November 25th, 2008. Merlis, Mark. "The Value of Extra Benefits Offered by Medicare Advantage Plans in 2006." The Kaiser Family Foundation, January 2008. Retrieved November 25th, 2008. Moon, Marilyn. Medicare. Encyclopedia of Public Health The Gale Group Inc., 2002. Retrieved December 5, 2008. Moon, Marilyn. Medicare: A Policy Primer. Urban Institute Press, 2006. ISBN 978-0877667537. Pear, Robert. "House Passes Children’s Health Plan 225-204." New York Times August 2, 2007. Retrieved December 5, 2008. Steuerle, C. Eugene, and Adam Carasso. "The USA Today Lifetime Social Security and Medicare Benefits Calculator." Urban Institute, October 1, 2004. Retrieved November 25, 2008. History of "Medicare (United States)"
This page was last modified on 13 September 2018, at 22:16.